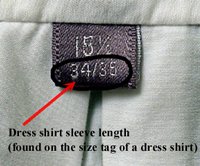 For your convenience, our Boys' In-Stock and Girls' In-Stock garments are made in U.S. standard sizes. There are also Made-to-Order & Custom-Tailored Barongs for Boys, made to your custom measurements. Rest your hand on the side of your hip, with elbow bent. Measure from the (backside) base of the neck, past the shoulder, around the elbow, to the wrist or the point at which you prefer the cuff to end. The tape measure should follow the outside of the arm.